Washington, D.C. – A revealing report by the Foreign Policy Journal from 2016 lays the groundwork for explaining many of the geopolitical manifestations we are currently seeing at play between the triumvirate of the United States, United Kingdom and France, and Russia—and how it relates directly to the Saudi role in the ongoing Syria regime change operation. By all measures, the Russian military’s intervention in Syria has been a resounding success for the Assad government and staved off the forces set loose upon the Syrian government by Saudi Arabia and its numerous terror proxies—one of which is Jaysh al-Islam—the Islamist rebel group that was holding Douma when the alleged chemical attack blamed on the Assad government took place. Without question, the Syrian government, while not in control of all the physical territory of Syria, has essentially won the war—although the United States and Kurd proxies hold vast swaths of land that hold oil, gas and water resources vital to the rebuilding of a contiguous Syrian state. So let’s rewind to November of 2017. Crown Prince Mohammed bin Salman, widely known as MBS, ordered the mass arrest and detention at Riyadh’s Ritz-Carlton of more than 300 Saudi princes and business leaders. The move was widely touted as a way to recover billions in lost revenue—but largely served as a means of consolidating power due to his recent unexpected succession to the throne. Although the Saudi government claimed the accusations of brutality were “absolutely untrue,” shares in several Saudi-owned enterprises plummeted. To bolster his legitimacy, MBS undertook a major “charm offensive” in an attempt to prime the U.S. market for the upcoming initial public offering (IPO) of Saudi state oil company Aramco, which experts predict will have a valuation in the range of $1 trillion to $2 trillion. The sale of a 5 percent stake in the company could take place at the end of 2018 or early 2019, depending on market conditions, Prince Mohammed told Reuters in an interview. Murray connects the Skripa poisoning to Syria and posits that rather than Moscow attacking the Skripals, as asserted by the British government, the event was actually a false flag meant to be blamed on Russia, as meant of further ostracizing them on the international stage. “Today, Theresa May is claiming—astonishingly—that the UK attack on Syria is ‘to deter chemical weapons attacks in Syria and the UK’. I don’t think the motive for a Skripal false flag could be more starkly demonstrated,” Murray added. Additionally, Russia has directly accused the UK and White Helmets group of engaging in a false flag operation in Douma, claiming they have “irrefutable proof” of the collusion meant to frame the Syrian government for the attack. The British government denies these claims and calls them Russian propaganda. Without question, the most vociferous advocates of military action against the Syrian government—outside of Saudi Arabia and Israel—are as Murray calls them “the Blairites in the UK and the Clinton Democrats in the USA,” noting that the “self-described ‘centrists’ are actually the unhinged extremists in today’s politics. Weeks prior to the alleged chemical attack in Douma, Russia warned that they had intelligence that indicated rebel groups were planning to engage in a plot to frame the Syrian government for a chemical weapons attack. The risk of miscalculation could potentially result in a drastic escalation and turn Syria into the roots of a regional or global conflict if Russian military personnel or assets are targeted or hit by western attacks. With Russia having given numerous warnings regarding retaliatory measures, this type of scenario is not out of the question. 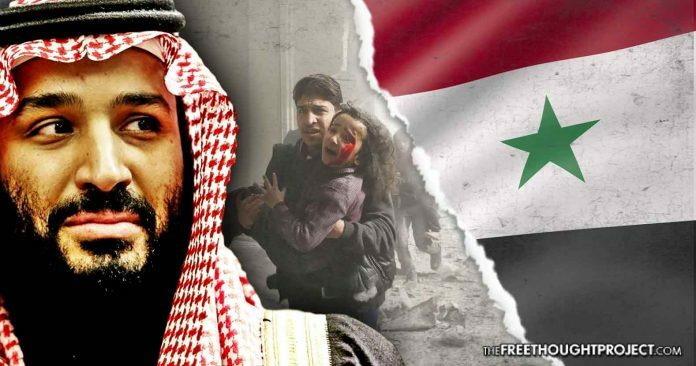 Why are the governments of the United States and the UK acting as lapdogs for the Saudi Monarchy’s ongoing regime change operation in Syria when there is a distinct possibility of it leading to direct confrontation between the U.S. and Russia? The trillion dollar IPO of Aramco most likely plays a large role in this power dynamic, as well as geopolitical pipeline politics. One thing is clear, the real hidden hand working non-stop at regime change in Syria has always been the Kingdom of Saudi Arabia, as evidenced by the internal cable released by WikiLeaks. Saudi Arabia has financed Islamist jihadis in Syria and provided them with arms throughout the conflict. While the security services of the U.S., UK, and France have played a pivotal role, and worked in concert with the Saudi initiative, make no mistake that the MBS and the Saudi government are the driving force behind the ongoing regime change operation.